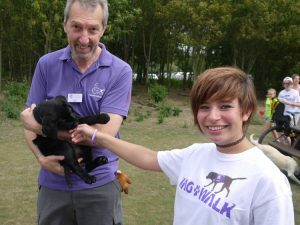 Canine Partners are delighted to continue working with the National Citizen Service. We hope that you will find ideas and inspiration here to help you create a project that is both rewarding and enjoyable, and that will help us to transform lives. There are two ways that a social action project could help us; either by raising awareness or through fundraising. There are several ways that you can help us raise awareness. You could start by using social media to share links with your followers to our website, Twitter (@canine_partners), YouTube and Facebook pages. In addition, if you are looking for something creative and that involves using technology, we are always looking for more resources to add to our website for schools and youth groups to download, so you could allocate your volunteering hours to work together as a group to create new and exciting resources for us. You’ll need access to technology as we will need to receive the resources you create in an electronic version. You will find everything you need to guide and inspire you in your Canine Partners NCS social action project by visiting our Education Resources page. Alternatively you could use your volunteering hours to work together to plan, organise and run a fundraising activity or undertake a challenge for us. Fundraising is a great way to have fun, develop your team building skills and to raise money to support our work. We receive no government funding so every pound you raise for us, and every minute of your time you volunteer, will help us to continue transforming the lives of people with physical disabilities. You can find sponsorship forms, posters to advertise your event and ideas of what you could do in our Fundraising Toolkit. We have more than 150 volunteer speakers across the country able to give a talk or a presentation to your NCS group. (Please note that we need to ask for a donation towards our costs, if you are able to give one). If you would like a volunteer speaker to visit your group, please contact us using the form here and we will be in touch with you as soon as possible.